Guy Fieri, the Food Network's raspy-voiced propagator of unhealthy recipes, was the unfortunate victim of grand theft a little over a year ago. His 2008 Lamborghini Gallardo was stolen from a San Francisco car dealership, leaving the bleach/spike haired chef without the car that completes his caricaturish public image. 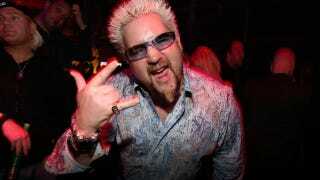 But Fieri, whose name sounds not unlike another type of enthusiast sports car, can rest easy now. Police have recovered the $200,000 car. It was found in a Bay area storage unit belonging to a particularly insane teenager. The celebrity chef has been uncharacteristically silent regarding the theft and the Lambo thief who's been on the lam for more than a year now. But the crook arrested for possession of the stolen car was anything but quiet. Police found Fieri's Gallardo when they raided a storage unit belonging to a 17-year-old suspected of shooting, from a black motorcycle, a man and a woman riding in a Ford F150. The truck's side windows were shattered by the shots and the fortunately unscathed drive-by victims were freaked out, but police think they may have killed two birds with one shot, so to speak. Last year, police said whoever stole the Lamborghini — they think it may have been the gun toting moto fiend — rappelled into British Motor Car Distributors in San Francisco, cutting bay door locks and making a clean getaway in Fieri's sizzling ride. Let's see, black motorcycle, drive-by, rappelling… guy sounds like a ninja to me.